Image Size: 19 X 16 in. 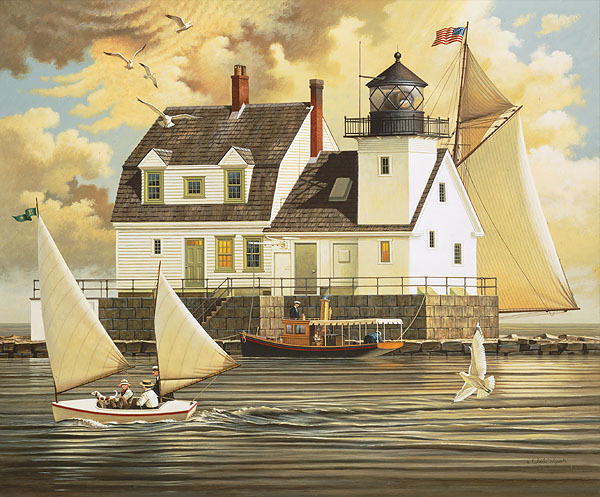 The first in Charles Wysocki’s Sentinels of the Sea series, this painting was inspired by the Rockland Breakwater lighthouse in Maine. Charles liked to tell stories in his paintings and along the New England seacoast he found them everywhere, from whaling museums to captain’s houses to 19th century lighthouses. A member of the U.S. Lighthouse Society, Charles loved to paint both real and imagined New England lighthouses. "They are unique expressions of human creativity,” said the artist. “Physically, they represent triumphant solutions to complex engineering problems. Emotionally, they conjure peril, rescue and poetry." Start your Sentinels of the Sea lighthouse collection with Rockland Breakwater Light where warmth glows from every window and a palpable sense of adventure is in the air as you leave your on-shore worries behind knowing that this grand dame will watch over you.